Those white shorts look like they've got clay dirt on them. Fitting for Rafa, but ugly AF. Rafa's USO day/night outfits can be found on N i K e T a L k (very similiar to last year, in my opinion). OR... they will jump a ton in value as they are now "vintage"
Only people, who have no idea what vintage really means, would pay for something like this as "vintage". I think you’re right! On their insta same framed pic from post on his Stuttgart and Halle stuff! This Rafa shirt for Wimbledon is $100. For what it is that is just plain crazy. Can’t decide if I’ll pick up a pair of Rafa’s Wimbeldon cages or wait for the US Open ones. Anyone seen pics of those? 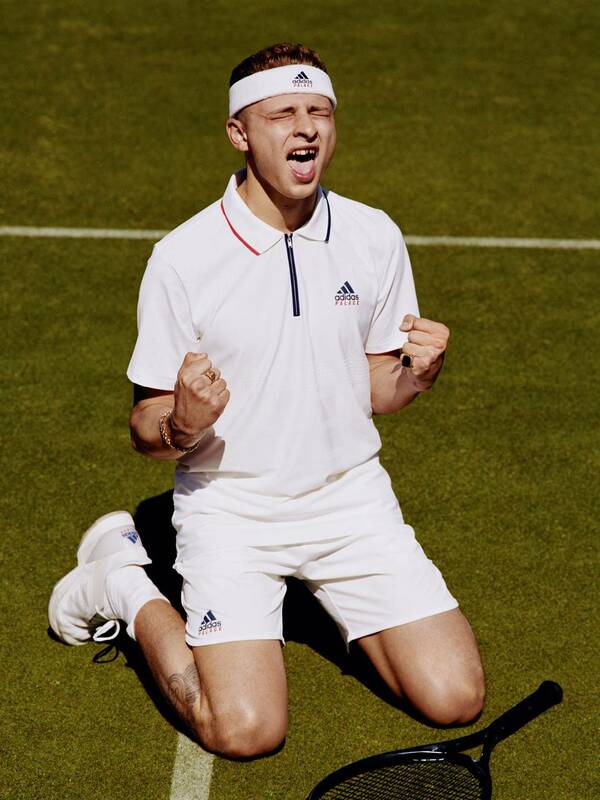 What do you guys think about Palace x Adidas for Wimbledon? The blue jacket is like a rain coat? There is an entire lookbook on the PALACE website. I must say that Adidas has created a fresh and clean look to the line that’s contemporary and at the same time not “trying to hard”. The fabrics look good and the line appears to be nicely styled. Certainly a huge step above what will be on Nike players at Wimbledon. Those shirts look way too loose on those pictures. Palace's skateboard heritage I guess. So far Adidas this year made ugly, but at least good fitting stuff. Also, it's good that the chest logo is back, shirts looked empty without it. Not a fan of toilet paper dots texture though. Just like the Pharell line. This is the NIKE FALL 2018 thread, correct? My bad. Just wishing Nike would do something fresh and interesting again like Adidas is. I digress. Is this guy a hockey player? It appears he is shy a few teeth. I don’t think he is a hockey player, likely a hipster based on the grill and the bad tattoos. I know that I am not that current on pop culture but are half grills an "in" thing? The nerdier the trendier it seems. He is a skate boarder slash entrepreneur from London named Blondey McCoy. Has his own clothing line as well. No clue why they thought he would be a good fit here. It's super unfortunate that it's "100% cotton"... For me at least. Does somebody know if there will be a boy's RF polo? But for a Brit those are nice choppers. Someone know where (or when) this t-shirt can be purchased? Thanks. I think the people across the street just called the police. Yesterday that white one wasn't on the website yet. Thx Georgek! You can check on Nusip Twitter what Fed was supposed to wear at the US Open. Not sure if it's a big loss that we probably won't see these ... (Nike, please ... can't be so difficult to do better). I hope Federer continues to wear vapors, that will atleast keep these threads going . Federer in Uniqlo though. It just feels wrong to not see him head to toe in Nike. Haha, cmon now. I am sure everyone can agree that Zverev & Muguruza are very good looking & can model the hell out of clothing lines - and most definitely with better teeth than this Blondy guy, lol. Aww...I would have had a good laugh reading posts like "who tf is this smug long horse looking guy. geraffes are so dumb"